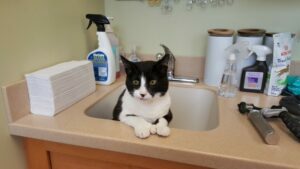 Though a visit to a vet is often an unpleasant experience for all the animals, cats are especially sensitive when it comes to the doctor’s tests and examinations. They will do everything to avoid the procedure. However, when they realize that it’s not possible, they immediately use alternative tactics. This is one of the reasons the following compilation is so hilarious. 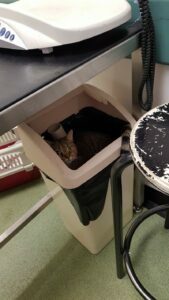 It reminds us that the kitties are really creative when it comes to hiding. They will do their best to remain in disguise, and when their plans do not work out, they become really worried about the outcome of the visit that had been discussed in advance. 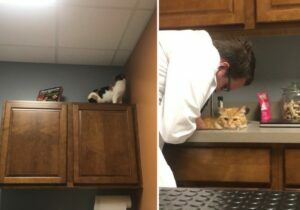 Below, you will see the guys who were reluctant to visit the doctor but eventually agreed that this is something that they need to do in order to please their owners. They are certain that they have tricked everyone, and we don’t want to let them down by telling them that’s not true. Check out the fellows who think that they are really good at hiding! 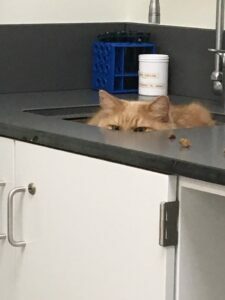 He was trying to hide in the sink, but then realized that this is not the way out! The little one is ready to sit in the dust bin. 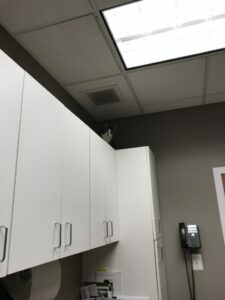 He is not going to face the vet by himself! This guy thinks that we won’t notice him if he is going to stay like that. The kitty is showing us that he is not content with his surroundings, that’s why he won’t leave his place. The fellow is not the first one to hide there, so the owner is not surprised when he finds him inside! 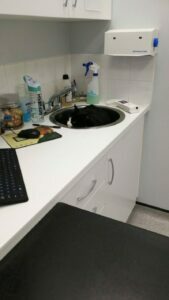 Vets are certain that there is a special connection between the cat in the sink and his fear of tests. What a cutie! The little one is so confident about his hiding abilities that he does not hesitate to come on top. 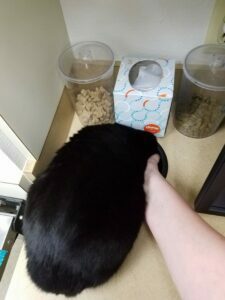 It is important for cats to know that they are safe. They will go to great lengths to make themselves comfortable, and this pet is not an exception. 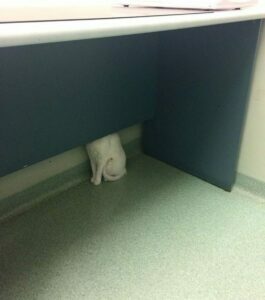 This cat is trying to make himself invisible, but this doesn’t seem to work the way he wants! 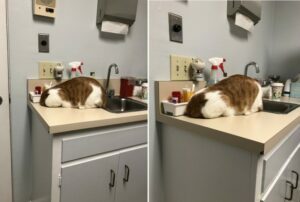 If the vets see that they can’t reach the cat, they invent their own ways to deal with the little ones that are good at hiding.